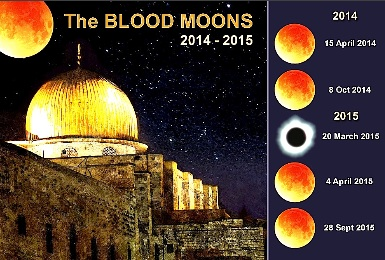 The Up Coming Blood Moons and eclipses will All Fall on Jewish Feast Days. This has happened 3 times and all have Fallen on Feast Days during Blood Moons, so these are Signs for ISRAEL and the Church or the Elect. God Speaks to us from SIGNS in the HEAVENS. The HEAVENS where MADE for that Purpose/ God uses the Heavens as his Billboard to Communicate what is coming. All of the Feasts where shadows of the REAL EVENTS that have yet to Come. There where 7 and 4 have already been Fulfilled with 3 left. 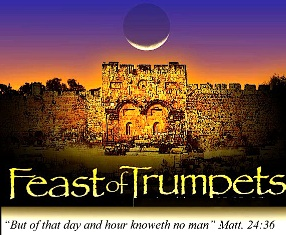 5) Trumpets (Leviticus 23:24) - The first of the fall feasts. Many believe this day points to the Rapture of the Church when the Messiah Jesus will appear in the heavens as He comes for His bride, the Church. The Rapture is always associated in Scripture with the blowing of a loud trumpet (1 Thessalonians 4:13-18 and 1 Corinthians 15:52). 6) Day of Atonement (Leviticus 23:27) - Many believe this prophetically points to the day of the Second Coming of Jesus when He will return to earth. That will be the Day of Atonement for the Jewish remnant when they "look upon Him whom they have pierced," repent of their sins, and receive Him as their Messiah (Zechariah 12:10 and Romans 11:1-6, 25-36). 7) Tabernacles or Booths (Leviticus 23:34) - Many scholars believe that this feast day points to the Lord's promise that He will once again "tabernacle" with His people when He returns to reign over all the world (Micah 4:1-7). When These SIGNS begin to Happen for Real, then the CHURCH will HEAR the TRUMP of GOD in the SPIRIT. We will then Be QUICKENED and TRANSFORMED. RAPTURE MEANS We are coming to our Right Mind/ His Mind. THE UPPER ROOM. That is what being Caught Away means/ Receiving the Mind of Christ. The SIGNS we are Waiting for will be much BIGGER then Just Blood Moons and eclipses. These Signs have a Multi Dimensional Meaning as well/ Since it will mean something else to the BRIDE/ She will not go into Mourning/ She will be TRANSFORMED at this time. In this Verse the Word WONDERS means/ Beautiful, Miracle. Jer 6:26 O daughter of my people, gird [thee] with sackcloth, and wallow thyself in ashes: make thee mourning, [as for] an only son, most bitter lamentation: for the spoiler shall suddenly come upon us. Amo 8:10 And I will turn your feasts into mourning, and all your songs into lamentation; and I will bring up sackcloth upon all loins, and baldness upon every head; and I will make it as the mourning of an only [son], and the end thereof as a bitter day. Rev 1:7 Behold, he cometh with clouds; and every eye shall see him, and they [also] which pierced him: and all kindreds of the earth shall wail because of him. Even so, Amen. At this Point they will be so Over come with Grief/ they will go into Mourning for what happened 2,000 years ago.